The IT department’s challenge is to make video meetings in conference rooms more effective, reduce video support calls and eliminate the need for “in room” video support services to get video meetings started. Are your video conference room users distracted by video or audio quality issues? Are they having trouble seeing or identifying who is speaking? Are they finding it hard to pan the camera to focus attention on the active speaker? Are they frustrated by trying to learn another user interface? Solve these challenges and video conference room use goes up. More room use translates to fully realizing the benefits of video collaboration and achieving your expected return on investment. 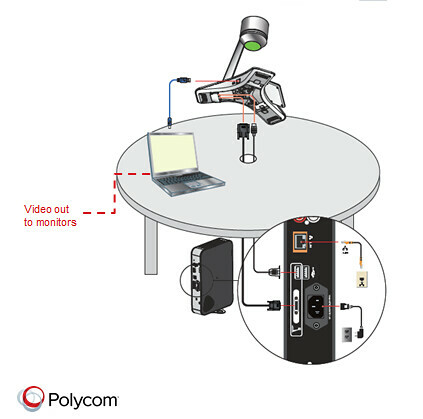 For Microsoft Lync users, the Polycom CX5100 unified conference station answers these challenges with a truly unique around-the-table video collaboration solution. Optimized for use with Microsoft Lync, the Polycom CX5100 unified conference station brings the powerful collaboration capabilities of Microsoft Lync voice, video and content together through a unique 360-degree panoramic view of the entire room. A second HD video view of the active speaker is also sent at 1080p video resolution using advanced technology that automatically focuses on the current speaker and tracks the flow of conversation to enable richer, more interactive communication. No more reaching for a video control device. It’s a “hands-free” experience that allows you to forget about the technology and simply focus on your meeting. An intuitive design with full plug-and-play functionality makes it easy to deploy and use the Polycom CX5100. With little or no training, anyone with a laptop that has Microsoft Lync can walk into the room and simply plug the CX5100 unified conference station into their PC’s USB port and start sharing voice and 360-degree panorama video. Control, invitations, and content sharing are handled through the familiar Microsoft Lync user interface your users already know and use every day. Removing the challenge of learning a remote control device means fewer support calls and fewer requests for “white glove” level support from the IT department. The Polycom CX5100 unified conference station features Polycom’s legendary audio, bringing the industry’s best voice quality to your Lync meeting with a dynamic range of 160 Hz to 22,000 Hz. Polycom® HD Voice™ and a microphone range of 20 feet (6 meters) means everyone in the room can be clearly heard, even at the end of the table. Optional extension microphones extend the range even further, if needed. While the Polycom CX5100 is a USB-only model, for customers needing standalone SIP VoIP for audio conferences, the Polycom CX5500 unified conference station adds SIP telephony, eliminating the need to install a separate audio conference station in the room. Optional extension microphones are available. The Polycom CX5100 is a “USB only” solution. Customers who desire stand-alone SIP conference phone capability in addition to USB camera and audio connectivity should consider the CX5500.